If you want to be good at mixing, you must be able to multitask. You need to manage multiple tracks, each requiring unique settings for levels, EQ, dynamics processing, ambience effects and more. You also must keep abreast of the assignments for those tracks within the routing scheme for the session that you’ve setup, which might include subgroups, aux busses and VCAs. Then you have to decide about which plugins are best for given situations (and how to use them), and make sure you’re not maxing out your CPU with all the processing you’re using. But that’s only part of it. It’s also crucial to keep track of the various versions of the session file that you create, and the mixes that that you bounced from them. If you're working for a client, it adds a whole other level of issues to deal with, including revision requests, deadlines and correspondence. With so much going on, staying organized is crucial. The following are some tips to help you do just that. The bigger the mix project, the more difficult it is to keep your tracks organized. 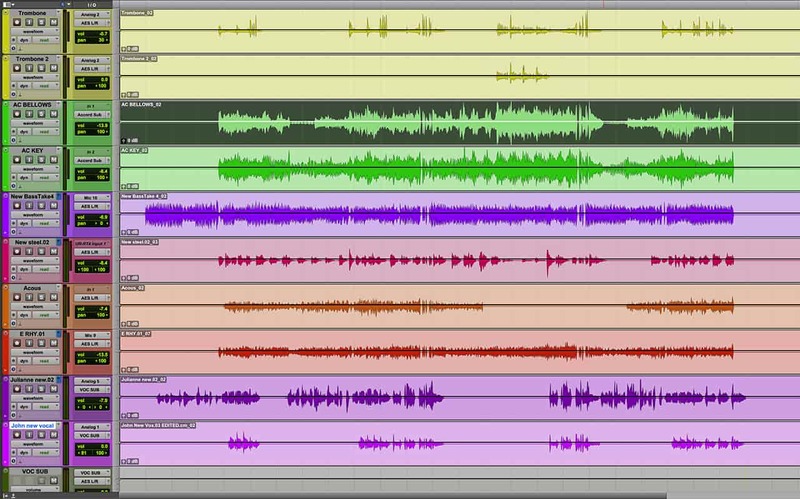 One way to help you stay on top of what’s going on in your session is to color-code your tracks based on the type of source. It doesn’t matter what colors you decide to use, but once you choose a system, stick to it from song to song. The idea is that by always making the drum tracks say, dark blue, vocal tracks red, bass tracks purple and so forth, you'll soon memorize what color each track type is. For each track, make sure that the track header and track lane are the same color (some DAWs allow you to assign them to be different). Once you have your system figured out, and you've color-coded the tracks, the next step is to arrange the similar tracks together. Put the drum tracks next to each other, all the vocal tracks together, all the guitars and so on. With your tracks color-coded and arranged, you'll find it much easier to grasp what's going on in your mix at a glance, and you won't have to hunt around as much for specific tracks. A mix that’s color coded and arranged by track type makes it a lot easier to know what’s going on at a glance. It’s helpful to use the same left-to-right order for tracks in your DAW's mixer, again, for the sake of familiarity. 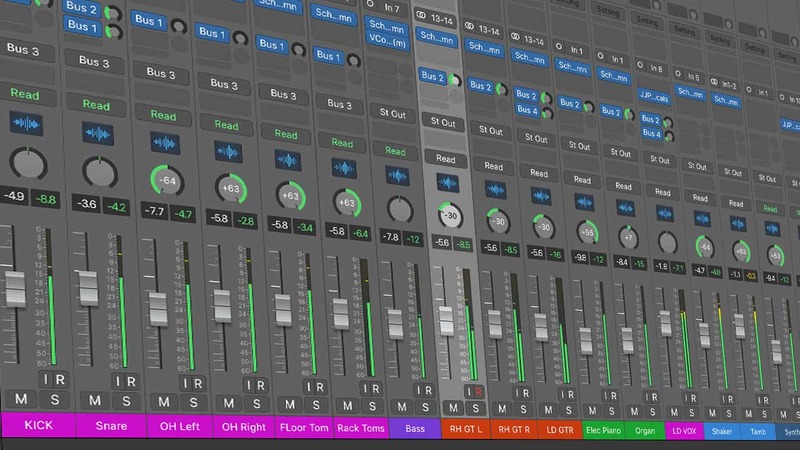 For example, you could put the drums to the far left, bass next to the drums, guitars next to the bass, keyboards next to the guitars, lead vocal next to the keyboards, background vocals next to the lead vocals, aux effects next to the background vocals, subgroups next to the aux effects, VCAs next to the subgroups and master to the far right. Within each grouping you should try to be consistent as well. This is particularly important for the drums where you could, for example, keep the kick to the left, followed by the snare, rack toms, floor tom, overheads, and rooms. The more you get familiar with the setup of your mixer, the faster and more confidently you'll be able to get around on it. With so many moving parts in a mix, one of the keys to success is to develop a rough workflow that you repeat on every project. Do you start with your mixer zeroed out, or do you continue with the settings you had during tracking? 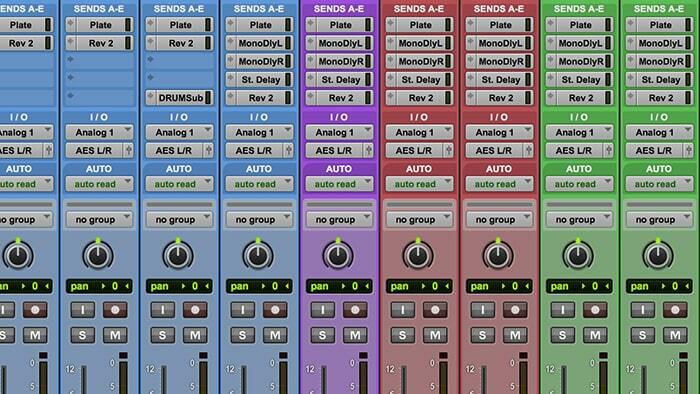 Do you start by getting a rough mix in mono, and then add panning? Do you always high-pass your tracks to remove unneeded low end? How often do you take breaks? How often do you check the mix in mono? The more you can do to make your workflow repeatable, the more you'll be able to get consistent results. Of course, on a micro level, things will be different from each time depending on the particulars of the song. Still, if you work towards starting your mix the same way each time, find that it works and approach the subsequent steps in a similar order, it can be quite beneficial. You can either create ‘model’ tracks that you’ll duplicate as needed, or start with a large number of mono and stereo tracks already created. If you have MIDI instruments that you use consistently, have them set on tracks in your template as well. Make sure your master track has the processing you typically use already inserted (either bypassed or not, depending on whether you like to mix with your master effects on from the beginning or not). It’s smart to have several types of reverb (based on what you tend to use) already on aux busses and have subgroups and VCAs set up (you can route the individual tracks to them as you go). Just make sure that your template is tuned to be at the right point for you to begin working: so that it provides the foundation to build upon for any mix, rather than being too bare or so far built that it gets in the way. An example of a basic template for a band tracking situation, which already has reverbs and busses set up for the mix. Not only does using a fine-tuned template save time, but it helps you develop a standard workflow routine. If you’re doing a multi-song project, it’s really helpful to adapt your standard template to create a custom one for that project that has the track names and color coding already included. Or, if you do different types of projects regularly, you could make different templates for each. One of the time-consuming aspects of mixing is choosing effects chains for the various tracks, a process that can involve a fair bit of trial and error and slow down the mixing process. Once you come up with successful settings for particular types of tracks, save them as channel strips. While there will obviously be sonic differences between similar elements in different songs—that is, not every kick drum or electric guitar or bass is going to sound the same—it's handy to have the channel strips or plugin chains that you've developed available at your fingertips to give you a starting point. You can incorporate your plugin chain settings into your templates, too. One easy way to save entire plugin chains is using StudioRack. In StudioRack, you can save presets of chains with up to 8 plugins each, making it easy to recall your favorite sounds for any application. 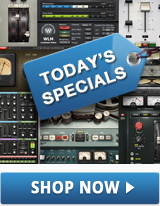 Imagine, you can easily pull up pre-built chains of say, warm vintage processors like TG12345 into CLA-2A and Kramer Master Tape for one application, while reaching for the DeEsser, followed by SSL E Channel, Renaissance Compressor, a PuigTec EQ and the C4 Multiband Compressor for another. Similarly, you can save effects chains for aux returns and have a few ready; like Abbey Road Reverb Plates followed by H-EQ, as well as with Enigma and Brauer Motion disabled, but ready to go for when you want to add that special sauce. Another area that needs to be well organized is your primary recording drive. If you have recurring projects or clients, give each one its own folder. Make sure that you set your DAW so that it's saving all of your audio files to the correct song folder. If your audio files end up scattered all over your hard drive, you're bound to have problems with missing data when you go to reopen a session. If you're not sure if you've saved the audio files to the correct folder, create a new folder and save a copy of the song (including all data) into it. Then move the old one to a "Do Not Use" folder that you create. (It's best not to delete it until you've finished the project, just in case.) And, of course, back up your drive regularly; preferably one local backup and one in the cloud. Did you ever finish a long mix session, listen the next day, and notice some things that are totally out of whack in your mix? The problem is that in an extended mix session, it's easy to eventually lose your perspective, and then make some, shall we say, "questionable" decisions. For most of us, it's almost impossible to know when we've reached the point of diminishing returns. That's why it's crucial to “save as” incrementally (mainly when you've made any significant change) and use consistent and descriptive session names that will allow you to backtrack quickly. You should use a consistent naming convention, and increment the version number each time you save. However, just a version number is not enough; you need to add a short description at the end of the file name that explains what the significant change was. The format could be something like "Song Name_version number_description." For example, let's take a hypothetical song called "Rock Me." The file name could be "Rock Me_v7_snare lowered -2dB" or "Rock Me_v9_delay on vocal,” etc. If you merely use version numbers, you have no way of knowing what changed when you made that save, and you'll have to spend more time sifting through the various versions you saved trying to find the point just before your mix went off the rails. With incremental saves and descriptive file names, that task will be a lot easier. If you're going to bounce a mix, first save your file with a new incremental name, and then make sure the mix has a matching version number. Otherwise, you could have a situation where your client chooses from several different rough mixes, and you can't remember which song file to open to access that mix and finish it. It keeps everything a lot simpler if your bounce version labels match your mix session version labels. When you've finished a mix and are sure it's complete, it's useful to do more than just save the DAW file in its final state. You want to save it so that it can be reopened in the future, even if you no longer have access to the same DAW and plugins. First, create a separate version and consolidate each track as an audio file that starts at the very beginning of the sequence (bar 1, beat 1). That way you'll be able to reconstruct the song in another DAW down the road if need be. Then save an archive version of the project, including only the files you used and excluding all the unused files and fragments to conserve size (your DAW probably has a feature for deleting unused files). If you have time, bounce out individual tracks with their volume, pan and effects included, so that you can pull up your exact mix at any point in the future if you no longer have access to the DAW and plugins. Consolidating your tracks as single files that extend to bar 1, beat 1 of the song, means you'll be able to open them in a different DAW in the future, if need be. A little time spent now can save you a lot of time and headache in the future. 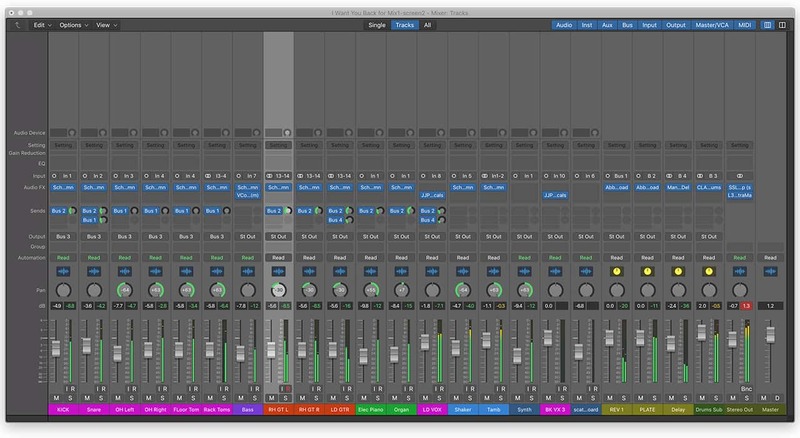 Want more on improving your mixing workflow? Get tips here on how to optimize your work.